Liberty Lift has the solution when you need reliable production. Our core team has more than 125 years in the artificial lift business. We combined that knowledge with solid engineering, innovative design, and manufacturing specifications that exceed API 11E to carry the API monogram. The Liberty Lift’s product line continues to expand, providing the ideal solution for all stages of your production lifecycle. Our service team is located throughout the primary U.S drilling regions. Equipped with necessary parts and experienced personnel, we are available 24/7 to provide installation, service and repair of our equipment and that of other manufacturers. 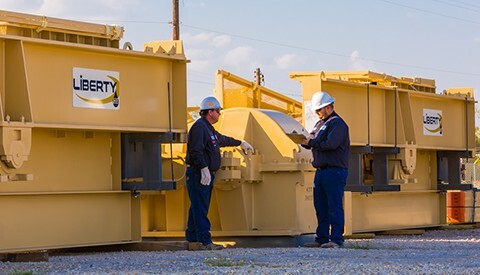 Mission: Liberty Lift will continue to advance the design and performance of our products and services to meet the changing environment of the oil and gas industry. Vision: To be the most customer-focused, knowledgeable, and successful Artificial Lift company in the world. We are available 24/7 to provide installation, service and repair of our equipment and that of other manufacturers. The Liberty Lift HE and EG Pumping Units are the result of more than 30 years of experience in the dedicated design, manufacturing and application of these products. Liberty Lift offers its gas lift system for both tubing and wireline retrievable equipment to maximize production in a well’s life cycle. The versatile Liberty Lift and JJ Tech jet pump solution incorporates a surface power fluid system, prime mover, surface pump and downhole jet pump. The Liberty Lift Long Stroke (XL) Pumping Unit offers an ideal means of managing production cost at an optimum level. The XL provides high performance, rugged design, greater efficiency, and proven reliability.